The Greenbridge roundabout will be transformed into a twinkling rainbow as Swindon Borough Council declares its support for diversity and inclusivity. At the request of the Swindon and Wiltshire Pride Committee, the lights on the Greenbridge roundabout will shine with the colours of the LGBTQ+ flag on two occasions this year. The first, on Friday (1 Feb), will mark the start of LGBT History Month, the annual month-long celebration of LGBT history and culture. The second rainbow display will take place from 5 to 11 August to mark the week in which this year’s Swindon and Wiltshire Pride event will be held. During last year’s Remembrance period, the Council used the lights on the Greenbridge roundabout to create a red and green poppy effect as a shimmering tribute to the fallen. And the authority is keen to use the lights again to help Swindon and Wiltshire Pride celebrate diversity and inclusivity. 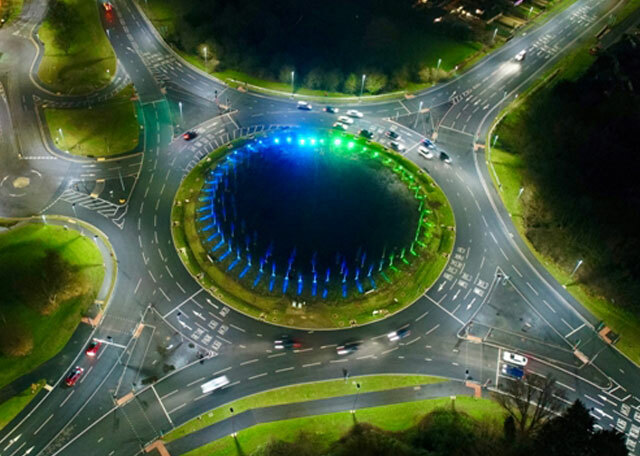 Councillor Maureen Penny, Swindon Borough Council’s Cabinet Member for Highways and the Environment, said: “The lights on the Greenbridge roundabout were installed with precisely this sort of thing in mind. The display has been made possible due to Affleck Electrical agreeing to waive the cost of programming the lights. The company has also offered to programme the lights for free for other charitable causes where feasible. Dan Grubb, Electrical Contracts Manager at Affleck Electrical, said: “Affleck Electrical have been the sponsor of Greenbridge roundabout for well over 10 years now. Phoenix Stewart, from the Swindon and Wiltshire Pride Committee, said: "We wanted something visual to mark the start of LGBT history month and this seemed like a fantastic way to raise awareness of this important month. “Swindon and Wiltshire pride will be posting information about LGBT History Month across our social media channels every day to promote LGBTQ+ history. “I would like to say thank you to the Council and Affleck Electrical for their support in making this happen."